Mike and I live outside of Gobles, Michigan on 3 1/2 acres. Gobles is 20 minutes west of Kalamazoo, Michigan. Mike and I met in a small town called New Carlisle, Indiana where I am from. In 2003, Me and a friend name Sue had a small kennel together. We were raising Bichon Frise, Havanese, Coton de Tulear. We fell in love with theses breeds because they were all Non-shedding, low in dander for people with allergies,great with children and had good temperament to be a great family pet. We wanted to focus on dogs that were good in all aspects for family’s with children and were good for small homes and apartment living. After I had my first litter of puppies I enjoyed nurturing,loving and caring and watching them grow was amazing to me.I enjoyed all the wonderful loving family’s that I had gotten to meet doing this.I knew then this was what I wanted to do. 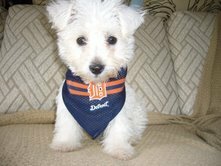 Mike then bought me some Westie’s and recently got a Yorkshire Terrier Colors of Chocolate,Parti, Gold,Black and Tan and fell in Love with a rare breed called Mi-ki’s have been very successful ever since I moved to Michigan. Thank- you for visiting our site!